In this white paper, we discuss nurses and nurse practitioners, which are among the nation's largest health professions. What are the educational pathways and licensing processes that produce the nation’s practicing nurses and nurse practitioners? How many of these nurses are working in the United States, and where do they practice? 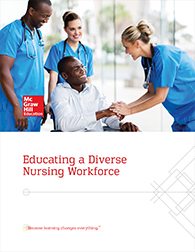 Is the growing racial and ethnic diversity of the nation’s population mirrored in the racial and ethnic composition of the nursing profession? To answer these questions, we begin by providing an overview of each of the nurse and nurse practitioner professions, describing the overall supply and educational pathways.